Do Flamingo Candles really live up to all the praise they've been receiving recently? Yes, yes they do. Bubblegum is exactly like stepping into my favourite childhood sweet shop, it delicately scents an entire room, lingering gently in the background. Raspberry & Vanilla blends slightly sour raspberries and sweet vanilla with a hint of something deeper ensuring it's never cloying. Made with soybean and cotton wicks they're non-toxic and burn for up to 50 hours each. 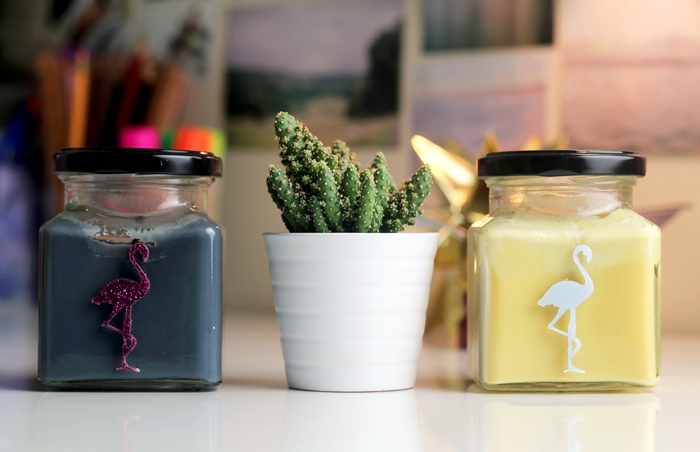 The jars are a little smaller than I was expecting but mine seem to be lasting forever. Each scent sounds absolutely divine, especially Vanilla & Black Pepper and Asian Pear & Plum. I bought Cheesecake Crunch for a friend for her birthday and was assured that the scent was almost as good as eating an actual real-life cheesecake. And they each have a flamingo on the jar. What could be better? Have you tried a Flamingo Candle? I've always wanted to try Flamingo candles. They look so sweet and the packaging is lovely! Ages ago I bought the mojito one and it was gorgeous. once i've used up the ridiculous amount of candles I already have I will deffo be buying more Flamingo candles - and yes the flamingo on the jar is a big selling point! I've never heard of this brand before! The packaging is ridiculously cute! Vanilla and Black Pepper.... oh my. I've been seeing these around everywhere lately and reeeally want to try one. Good to know they're worth the money! Bubblegum? I most definitely need this in my life. I love Flamingo Candles! I've had to reason with myself not to buy any more until I've used up the three I currently have but there are so many scents I'm dying to try! I've had a few of these now and I love them. They last for ages, look good and give off enough scent without being too overpowering. I always imagined these candles to be more expensive! The scents sound amazing. Natural Make Up and Acuvue Define Contact Lenses! Current Make Up Collection + Storage! Favourite Make Up Products Under £10! Five Things + Five Blogs I Love! Skincare | Back to Basics.